Another great recipe from Anna Jones’ A Modern Way to Eat. The veggie version of a classic meat dish which is completely delicious. The base of the dish are beetroots (tip on peeling fresh beetroot: wear rubber gloves otherwise you’ll dye your hands! Red juice goes everywhere), parsnips (although I used carrots instead) and mushrooms. Of course cooking with wine makes it all good too but the beetroot really made this dish. I’d make sure I cut the beetroot smaller next time, as mine didn’t cook enough in the time, and maybe I’d try using pre-cooked beetroot, although I don’t know if they would go too soft? The stew also had pearl barley and flavoured with bay leaves and thyme. I served mine with cauliflower “mash” but would be great with potato mash, rice, crusty bread too. 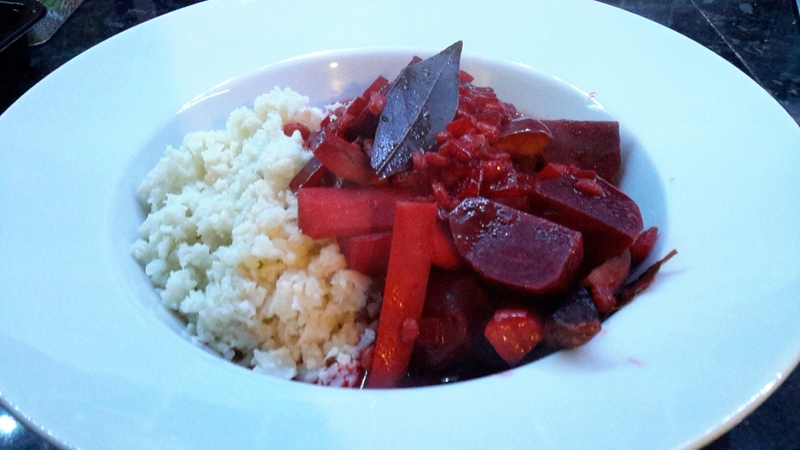 This entry was posted in Main dish, Vegan, Vegetarian and tagged anna-jones, beetroot, carrots, mushrooms, wine. Bookmark the permalink.